Park on Bell is a fairly nice locale and shines very brightly in comparison to its immediate competition, but could still use some extra features to beat the best. Still, it's a comfortable, quiet complex with plenty of modern amenities and privacy to be a good place to call home. Pros include: Ostensibly private balconies with high walls are very attractive. All ceilings are 9 feet. The exterior and grassy areas are well kept. A gorgeous 24-hour pool area is a great deal for night owls, although there is a quiet time in effect. On the down side, majority of the living area is carpeted in all apartments, even though it is a high quality berber, interiors could have more attractive qualities. The community room has a slightly lacking edge, missing billiards tables or other features to influence residents to come in. Park on Bell is, as the title says, on Bell Road and Central Avenue. Bell can be a busy street, so entering through the only entrance off the road can prove difficult at busy hours of the day. The property itself is gated and very lush with grass and greenery inside, radiating comfort, safety and beauty. Park on Bell is the luxury apartments to be at on Bell Road! Enjoy lush views, a sparkling pool with 24-hour access and beautiful homes with the top appliances and features for apartment living. One visit to Park on Bell will have you here forever! Park on Bell is a 1-unit apartment complex featuring 1 to 2 Bed floorplans. If nothing caught your eye, don't be worried. 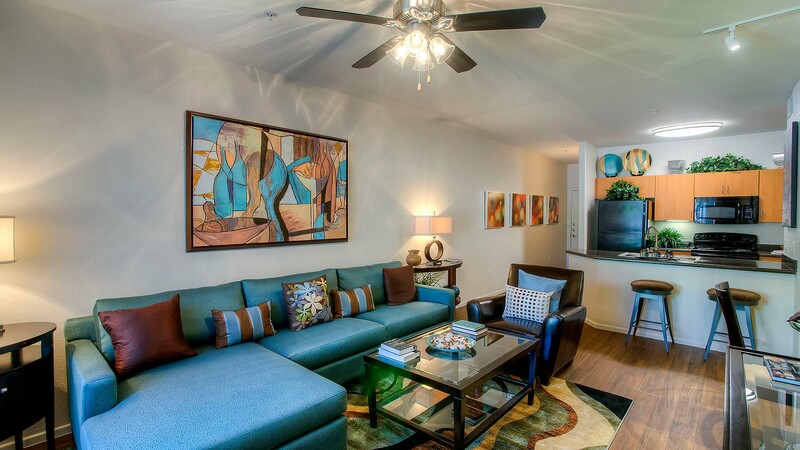 Search for more apartments for rent in Phoenix.